At Comic-Con in 2010, Mattel sold a version of Orko that turned clear (or colored) in hot or cold water. This figure had a faded, ghostly appearance and I found it unpleasant. 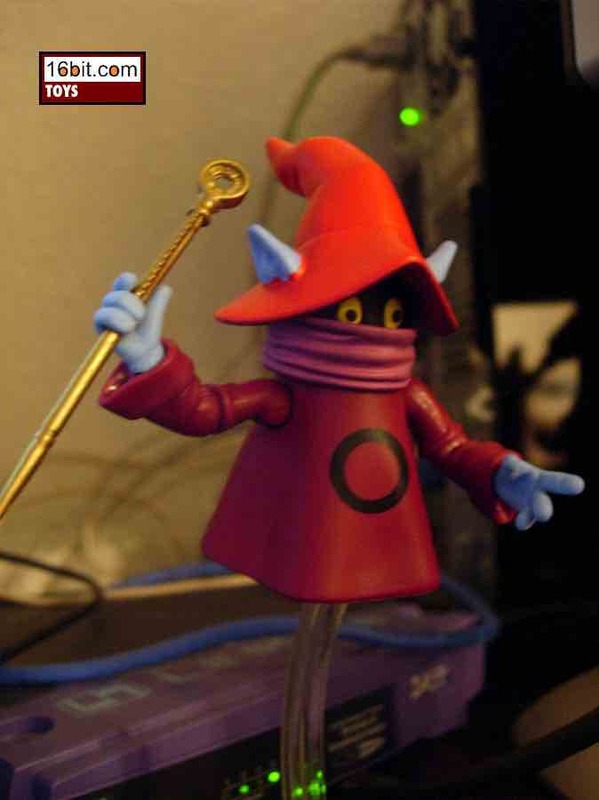 Thankfully for me Mattel had a fuly-painted cartoon-style Orko ready to go as the MattyCollector.com exclusive repaint, which you can see here. The figure has ball-jointed shoulders, elbows, and his head too. The wrists have swivel-joints, and you can "stand" him on a clear display base to give him the illusion of floating. The best thing about this figure? 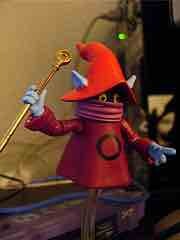 It's freaking Orko. The pinkish purpley band around his face moves, so you can adjust that to alter his facial expression. It gives Orko the illusion of looking even more nutty if you're so inclined, and with all the gestures he can make with his arms the little guy has a lot of personality. Not counting his display base, the Eternia court magician measures about 3-inches tall from the base of his shirt to the top of his hat. While Mattel's Masters of the Universe Classics line is consistently beautiful, it sometimes has difficulty really impressing fans-- once you nail a fantastic design with great articulation and detail, it's easy to get jaded. The sculpt is perfect-- what the heck can you do to make it more exciting than perfectly cartoony and awesome? An action feature would make it less exciting to older fans, so Mattel's decision to just keep him simple and floating was absolutely the right move. His exposed blue skin and bright red hat look great together, but on our sample the paint seems to bleed a little between the colors-- you can see this in the photo right on his ear. This particular set also included a full-size Prince Adam figure packaged beneath Orko and billed as an accessory. Who says Mattel doesn't have a sense of humor?